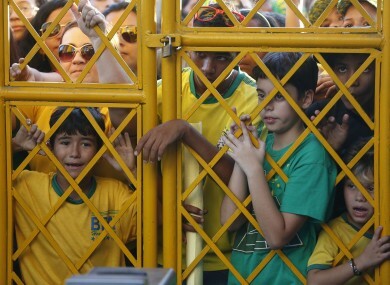 Brazilian supporters gather outside the team's training ground. BRAZIL’S FORMER PRESIDENT Luiz Inacio Lula da Silva, who secured the World Cup during his administration, says the tournament’s success will teach a “lesson” to those who predicted failure. Lula accused some media of hyping up fears of violence, protests and chaos before the World Cup in the wake of massive, and sometimes violent, demonstrations during last year’s Confederations Cup, a dress rehearsal to the ongoing event. There was also concern about stadium delays as workers had scrambled to finish several of the 12 arenas just days before the June 12 kick-off, but the games have taken place without incident. There was terrorism before the cup,” Lula said, referring to the dire predictions. Small protests have been held during the tournament, attracting a few hundred people at most, though radical protesters have clashed with riot police on a few occasions. While Brazil has largely avoided unrest, Lula addressed an illegal ticket sale scandal that has rocked the World Cup on the eve of Friday’s quarter-finals. When I saw the news that there are scalpers who can be from FIFA or not, it scared me because it means that there are people inside the organization who want to make more than they are already making through a parallel market,” he said. Police probing an international scalping syndicate said thousands of illegally sold tickets worth millions of dollars were believed to have originated from an individual within FIFA, football’s world governing body. Email “Brazil's brilliant World Cup teaching naysayers a lesson, says Lula”. Feedback on “Brazil's brilliant World Cup teaching naysayers a lesson, says Lula”.